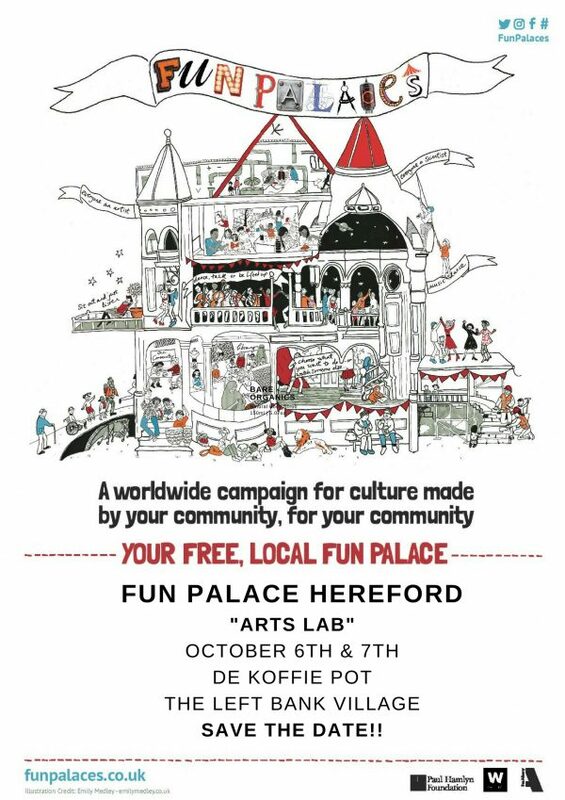 FUN PALACE HEREFORD Saturday 6th – Sunday 7th October 2018 at De Koffie Pot, Hereford. Help create a weekend of fun, free and local participatory Art events and workshops, music, film, science, sport and performance all together at De Koffie Pot, Left Bank Village organised by Arts Lab Collective. You can cook, paint, drum, run, sit quietly with a drink or some food and listen to music, watch films, listen to stories and view Artwork from local Artists and students from Hereford College of Art, and much more! Creative cooking making seasonal apple tarts from scratch. We will be mixing, stirring, sprinkling and of course eating! Choppin’ and crushin’ and tasting. Apples provided or bring your own. Ceramics workshop and learn more about this exciting new open-access ceramic studio about to open in Hereford. 90 min drop in session to try out the creative toolkits used to produce high quality art sessions for older people in the community. A variety of unusual short films for all ages down in the Speakeasy. Perfect for a lazy October Sunday afternoon.